The Great Books Foundation Blog: Does Writing Improve Reading? Research supports Faulkner’s advice, and it doesn’t only apply to aspiring undergraduate writers. When children read extensively they become better writers. As creatures of imitation, it makes sense. Reading well-crafted sentences helps us learn to compose well-crafted sentences ourselves. So reading more improves writing, but is the opposite also true—can writing improve reading? I know—there are endless reports about education and instructional practices. It’s hard to deduce which findings are useful to teachers. However, Writing to Read stands out because it summarizes high-quality research using the powerful statistical method of meta-analysis. The method allowed researchers to determine the consistency and the strength of an instructional practice, and to identify effective instructional writing practices that improve the reading abilities of students. By identifying which writing practices positively impact reading, the report helps teachers implement the best practices in their classrooms. The findings don’t surprise us—students write about what they read in all Great Books programs. Great Books writing instruction aligns with the report’s findings even more specifically—Writing to Read found that student comprehension improves when they respond to a text in writing (writing personal reactions, analyzing the text); when they answer questions about a text in writing; when they create and answer written questions about texts; and when they write notes about a text. Students do all of these things in Great Books writing activities. 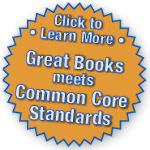 In each Great Books unit (Junior Great Books Series 3–5 and Great Books Roundtable 6–8), student writing is connected with the stories they read. Students learn how to write well-organized expository, creative, and interpretative essays; they write notes, responses to, and questions about each story; they use modeling, guided practice, webs, and templates to organize their thoughts; they edit and revise their writing with the help of peer reviews and rubrics; they even respond to other students’ ideas in writing. All writing activities are linked to the story, repeatedly bringing students back to the text and engaging them with it in a variety of ways. Confirmation of the interconnectedness of reading and writing is nothing new. But evidence that writing improves reading—specifically that writing about texts improves students’ comprehension—is relatively new and is certainly worth remembering when planning curriculum. While Faulkner’s advice to “Read, read, read!” still holds, now we know students should also write, write, write about what they read. Thanks for sharing this important information. It's a call for teachers to carve out more time for writing in their literacy instruction.